Find out more about the science and aims of the 'Zika Mozzie Seeker' project by checking out the frequently asked questions below. These will be updated and expanded throughout the project as we receive your feedback. What does a 'Zika mozzie' look like? In Australia, 'Zika mozzies’ (Aedes aegypti species) can be found throughout much of Queensland, especially North Queensland. However, they have not been recorded in South East Queensland since the 1950s. The ‘Zika Mozzie Seeker’ project will help increase our confidence that they are not present in the Metro South Health region of Brisbane and improve methods for dealing with any invasions. 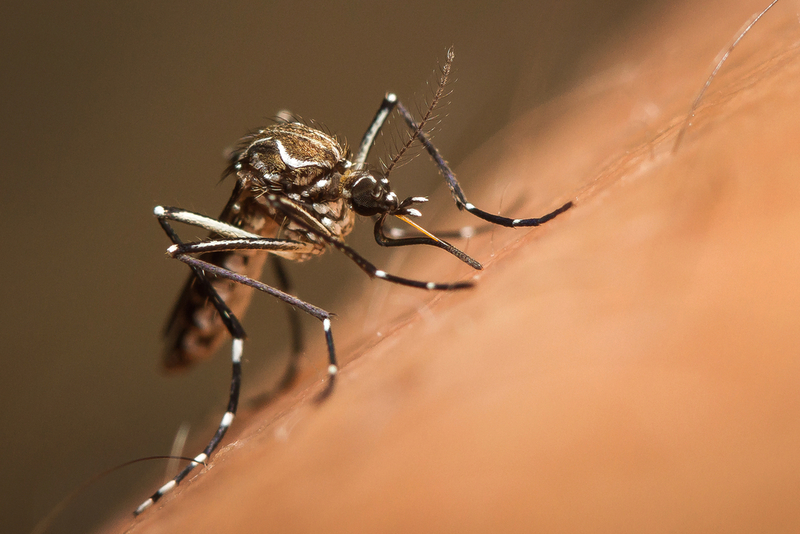 The female Aedes aegypti mosquito prefers to bite humans and has the potential to spread diseases, such as Zika and Dengue. The male mosquito doesn’t bite. Aedes aegypti mosquitoes breed in containers of water around homes, such as water tanks, discarded bottles or flower pots. They like resting in cool, shaded places in and around homes and they are active in daylight hours. More information about Aedes aegypti mosquitoes. Why are we using backyard mosquito egg traps? ‘Zika mozzies’ (Aedes aegypti species) don’t fly far from breeding sites – only 100-200 metres – so finding them in the early stages of an invasion in large cities can be extremely difficult. It’s like looking for a needle in a haystack. We currently work with local councils to manage a small network of mosquito egg traps at the main entry points for Aedes aegypti mosquitoes into South East Queensland. However, this system does not monitor all areas of large cities for such mosquitoes. For more effective monitoring in large cities, we need to place more egg traps in a wider range of locations to increase the range and intensity of the sampling. A good way to achieve this is to place egg traps (ovitraps) in lots of urban backyards. The help of the community is important – we need traps in as many backyards as possible to stand the best chance of detecting an invasion of Aedes aegypti mosquitoes, so please get involved if you live in the Metro South Health region. What is special about the DNA testing used on the mosquito eggs? A world-first DNA testing method makes the ‘Zika Mozzie Seeker’ project possible. The method allows Rapid Surveillance for Vector PresenceRapid Surveillance for Vector Presencescientists to quickly screen large numbers of freshly hatched larvae (wrigglers) from mosquito eggs (up to 5,000 in one sample) for the DNA of Aedes aegypti mosquitoes. Previously, scientists had to grow and painstakingly examine each larvae under a microscope. The project is possible due to a successful collaboration between Metro South Health, Queensland Health and Brisbane City Council. Metro South Public Health Unit (Medical Entomologist Brian Montgomery) invited Queensland Health Forensic and Scientific Services (Dr Andrew van den Hurk and Dr Sonja Hall-Mendelin) to explore a novel use of their molecular diagnostics to screen mosquito eggs. The DNA testing method was developed using mosquito eggs from a network of traps set up by Brisbane City Council (Dr Martin Shivas) and Metro South Public Health Unit. ‘Zika Mozzie Seeker’ is currently a pilot project confined to the Metro South Health region of Brisbane, especially urban backyards. However, there is potential for it to be expanded to other areas of Brisbane and South East Queensland in the future. Citizen science is an opportunity for members of the public to take part in scientific research, especially collecting data about the natural world. The ‘Zika Mozzie Seeker’ project is one of Australia’s first health-based citizen science projects. We’re looking for members of the public to collect mosquito eggs using traps in their backyards so we can test the DNA. For details about 'Zika Mozzie Seeker' as a citizen science project, please see the Atlas of Living Australia's Biocollect website. How can I find out more about Zika and Dengue viruses? Zika virus can cause a short illness similar to Dengue fever, but milder. However, there are possible risks to unborn babies if a pregnant woman is infected with Zika virus during her pregnancy. No cases of locally-acquired Zika virus have been reported in Queensland and Zika is not known to be present in local mosquitoes. More information about Zika is available on the Queensland Health website and Australian Government Department of Health website. Dengue fever is a viral illness with symptoms similar to a severe case of flu. Dengue virus is not endemic in Australia, which means the virus is not normally present in Queensland unless someone brings it into the country. More information about Dengue fever is available on the Queensland Health website.